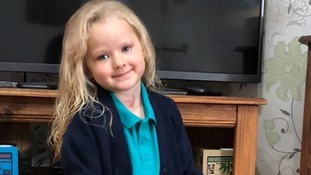 A four-year-old girl born with a tennis-ball sized malignant tumour in her neck has started school, having made an "amazing recovery". Jenna Smith from Penrith has been through months of chemotherapy and was not able to speak until she was nearly three years old due to having a tracheostomy tube. The tumour, which was so large it had flattened her windpipe, was discovered when her mother, Lisa Smith, 42, was 32 weeks pregnant. Doctors feared that Jenna would not be able to breathe when she was delivered, meaning she need an operation to insert a tracheostomy. However, Mrs Smith's waters broke earlier than expected and she had an emergency caesarean section at Newcastle's Royal Infirmary in March 2014. Hospital to have the tumour removed, and it was discovered it was a malignant mass requiring chemotherapy. In February 2017 she had the tracheostomy tube removed, enabling her to speak properly, and now remains in remission, the Royal Victoria Infirmary said, calling it an "amazing recovery". She has now started in the reception class at Stainton Primary School near Penrith. "Looking back on those early days of Jenna's life, it was horrendous. "Now, thanks to everyone at the RVI and the Great North Children's Hospital, we have a beautiful, happy, healthy little girl. "She is very excited about starting school with her friends from nursery. It's another big milestone in her short but eventful life."